Building robots and rockets, learning coding skills, designing computer games, getting stuck in to 3D design, electronics and model-making are just some of the activities like-minded students enjoy at a Tech Camp course. All projects involve innovative take-home projects, so the learning and fun can continue at home. Established in 2008, Tech Camp is the UK's original and longest-running provider of such camps, which students can attend in either Winchester (residential) or London (non-residential). Students from across the UK – and from further afield - attend the camps and learn from tutors with bright, young minds and a passion for the techie world. 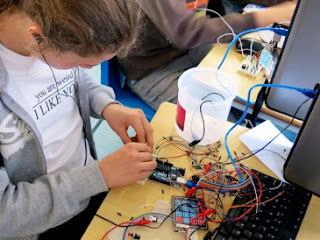 Tech Camp was founded by Tom Ward, an Electrical Engineer who previously worked as Head of Science at Elstree School, Berkshire. Tom is a self-confessed ‘techno-nerd’ and proudly admits he was a bit of a boff from school days. He was a national winner of both the "Beyond 2000" science competition and the DDIAE computing competition whilst at school in Australia. More recently, he has been a winner of the“Circuit Cellar” Electronic Design Competition in the US, has written articles for trade journals and is the technical publisher O'Reilly ("Best of Instructables"). He was short-listed for a ‘best e-learning Initiative’ award by the Times Educational Supplement for a science learning game he developed. Tom often presents workshops for The Science Museum, Maker Faire events in the US, and at the Cheltenham and Abu Dhabi Science Festivals. “At Tech Camp we remain among the best in our field – we’ve been investing in the inventors of tomorrow since 2008 and are committed to helping train young people to help ensure the gaps are filled with our own home-grown digital specialists. “By attending our camps, young people get to learn fascinating and very practical coding skills which will help them stay ahead of the pack, and with so many incredible opportunities opening up in the world of digital, what we’re doing is not rocket science. Ok,some of it is but that’s beside the point. Tutors are carefully selected based on their specific technology-related skills, their love of the tech-industry and their genuine ability to inspire tomorrow’s inventors. In fact, some of the tutors are ex-Tech Camp students themselves, who are now studying tech and engineering at the likes of Cambridge and Imperial. Small tutor groups are maintained –with a maximum of 1:8 staff to student ratio - to provide the best possible experience. Tech Camp’s innovative course material has been developed over seven years and is continually refreshed to appeal to both beginners and serious ‘Tech-Heads’. There are two venues for this Summer’s events For details on this years camps (including prices, dates, etc), please visit www.techcamp.org.uk. Tech Camp promotes diversity at its camps – and is keen to inspire all students with a love of techie things. On a broader level, it supports and encourages students to study the broader STEM skills, because of the importance these will have in future careers and for the UK economy as a whole.